Recently I published a Quick Take on the book Sales EQ by Jeb Blount. Below is a table listing the key concepts that Blount introduces in the book. Many of these concepts will be familiar to readers of other books on the subjects of personal development and effective communication. What makes Sales EQ such a compelling read is the way Blount introduces these potentially complex or intimidating concepts in a concise manner, all within the context of the unique relationship between a seller and his or her stakeholders. Next up on leadertainment.com will be a downloadable summary of the major sections of the book Sales EQ by Jeb Blount. Looking for more great books? Check out the essential reading list. Yes, this is a psychology book: it helps you understand human emotions, cognitive patterns, and communication styles in order to build more effective relationships. Jeb Blount’s book, Sales EQ, explains these concepts in the context of the very specific relationships that exist between a seller and his or her stakeholders. Most popular sales books focus on the sales process, qualification techniques, and the mechanics of closing (Sales EQ adds a few of its own, also). Let’s call these “the what” of selling. Other sales books define common personas, found in either buyers or sellers, exploring the attributes of each persona and how they lead to higher or lower win rates (Sales EQ also contributes to this category. Let’s call these “the who” of selling. What sets Sales EQ apart, and what makes this such a unique and profound work when compared to other sales books, is how concisely and comprehensively it covers “the how” that sits behind both the what and the who of sales effectiveness. Blount takes the framework from Daniel Goleman’s research on Emotionally Intelligent Leadership (HBR, 1998-2001), and expands it to include concepts on decision making and communication introduced by authors spanning Cialdini, Pink, Heath, Carter, Ekman & the Dalai Lama, and more. Has your team burned through a stack of sales methodology books and acronyms, from SPIN Selling, to The Challenger Sale, BANT, DISCOVER, MEDDIC, WOLFE, and everything in between, yet still struggles with low quota attainment and high turnover? Have you sat in the room with a top-notch seller–either as a peer or a buyer–and been mystified with how effortlessly they get to “yes”? For anyone who nodded to the questions above, or would simply like the convenience of finding 12 books on human emotion and communication condensed down in one volume, Sales EQ is a must-read. Interested? Review my list of the key concepts from the book Sales EQ by Jeb Blount. Look for a downloadable book summary soon, here on leadertainment.com. In the meantime, check out other highly recommended books on the essential reading list. In the words of Peter Drucker, patron saint of business leaders everywhere, “there is only one valid definition of business purpose: to create a customer.” Many professionals in private practice, such as designers, health care providers, architects, etc., rely on the quality of their work to sustain the growth of their business. At some point, repeat business and word-of-mouth referrals become insufficient to supply revenue required to grow (or sustain) a business. Larger companies often face the same challenge, but this post is directed more towards small businesses run by professional service providers. Whether you have just set up your own professional service business, or are looking for more “tech savvy” ways to grow revenue, invest time in understanding the answers to the three questions below and you will see the payback very quickly. Who are my contacts, leads, and customers? Customer Relationship Management (CRM) has evolved several generations since the Rolodex. A web-based CRM database gives you secure, fast, permanent access to the contact details and history of interactions with everyone who’s paid you, and everyone who hasn’t – yet. Ideally, your CRM system will be integrated with marketing and content management tools (see below) to work more efficiently. Which tools? Salesforce is the king of CRM, and other quality options that I trust that can fit a range of budgets are SugarCRM, NetSuite, and Apptivo. Is my most engaging content reaching my most valuable customers? Brand reputation is maintained by the quality of the products and services their companies provide. But at any given moment, a very small percentage of the customers who are aware of a brand is actually purchasing from the company. The rest are either recent buyers (potential repeat customers at risk of buyer’s remorse) and future buyers looking to learn more about a company’s capabilities and form an emotional connection (because all commitments, financial and otherwise, are made with the head and the heart). To establish and maintain this connection, a firm first needs to generate great content, and then ensure it reaches key audiences through the channels they use most. This requires content management across multiple channels: web, email, blog, social media, and advertising. A structured approach can prevent spinning wheels and slipping down rabbit holes: here’s a very pragmatic checklist for creating a blog from Build. Which tools? Squarespace and Jetstrap are powerful and intuitive website building tools, WordPress is a leading blog management site that can easily add more functionality, Verticalresponse makes managing email marketing with analytics very straightforward, and a presence on LinkedIn, Twitter and Facebook are table stakes for any business these days. Which lead channels are producing the most profitable sales? Don’t forget, you’re doing all this to make more money…so the last step is to check that all your contacts are reading all your content and actually buying more of your stuff. To do this, make sure the tools you choose provide the data–or even better, a button to click that gives you the answer–about which lead channels are producing the most profitable revenue streams. Should you increase your advertising budget, block out more time for in-person events, encourage more personal referrals, or nurture more repeat business? Which tools? The CRM tools referenced in #1 above will all provide a sales funnel and lead analysis package. Of course this can be done with good old fashioned spreadsheets, too: feel free to contact me if you need help getting started. So what are the outcomes you are trying to achieve from the Intake phase of the talent cycle? Anomalies in these metrics will point you to the parts of the system that must change in order to achieve different results. if your applicant tracking system doesn’t generate a dashboard of metrics similar to these, you may have to build your own. Start with a white board and upgrade to Excel or an easily configured database (like Quickbase) once you know what you want to measure, when, and how. Next up: key metrics for the Development phase of the talent cycle. What metrics have you used to measure talent intake? which of these are useless? Leave a comment! Most leaders would agree that having the right talent on their teams is essential for success, and recently Build Network has confirmed this hunch in a leadership survey. The goal of this post is to provide some structure to the talent cycle and help leaders get the most from their talent by segmenting the tenure of any employee into four phases: Intake, Development, Delivery, and Transition. While similar to the four stroke engine cycle, we’ll try to limit the amount of compression and ignition we put our employees through. Except for the stereotypical Japanese salarymen, very few employers expect to need more than one hand to count the average tenure of staff. And while the US Department of Labor’s 2012 data showed average tenure across all industries has increased to 4.6 years from 4.4 in 2010, data compiled earlier in 2013 by Payscale showed employers in retail and IT companies should expect closer to 2, as reported by Business Insider. And based on the bankrupt and bailed out companies at the other end of the Payscale list, and the bankrupt and bailed out countries in the OECD data set from 2011, seeing tenure rise above 10 years should be a warning sign (especially when long tenure comes along with unsustainable pension obligations). So let’s make the math easy and propose you’ll get 2 years of contribution, on average, from your employees. I’m defining the Intake phase as the period from the first touch during recruiting through the first 90 days of employment. Take off the last month before exit for Transition, and we are left with 20 months. So if the goal is to maximize the contribution to the business from each employee, it’s important to “compress” the Development period, which I’m defining as the length of time required for an employee to become fully competent in role. Intake: starts with first contact with a prospect during recruiting, ends at day 90 of employment. 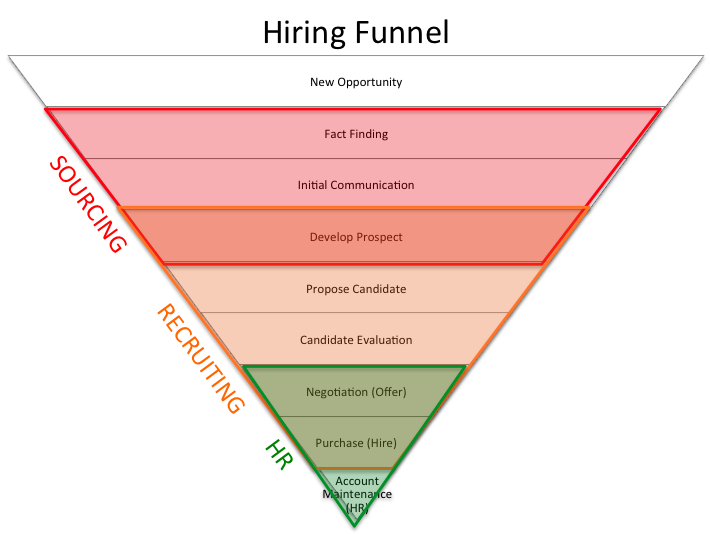 Recruiting, onboarding, and orientation are key processes. Coordination between HR, Facilities, IT, Finance, and hiring managers is essential to establish new employees with high engagement and reduce early exits. Development: from day 91 through the point at which an employee is fully competent in role. Coaching, training, and peer support will help ensure employees can contribute high quality work, independently, as quickly as possible. Delivery: could be as short as a few months for organizations with low overall tenure and long intake and development periods. Transition: allowing for knowledge transfer from an outgoing staffer to the incoming hire. Internal promotions will allow for longer transition periods, but most US employment agreements expect only 2 weeks notice. An upcoming series of posts (linked in the list above) will look at the key metrics to track in each of these phases of the talent cycle, along with the most important processes to streamline in your organization to ensure your team is happy, developing, and delivering at each phase of the cycle. Adapting Tolstoy’s famous opening line about families to business: “every unsuccessful business is unsuccessful in different ways.” One way that I’ve encountered in numerous settings is the disconnect between corporate goals and the work that people do every day. As we’ve come to understand employee motivation more completely over the years through the work of authors like Daniel Pink, being able to tie daily tasks to larger objectives or a shared sense of purpose improves retention and performance. But setting corporate goals is a difficult process because, by necessity, they are big. How can we phrase them in a way that is actionable — so that regular Joe and Jane can come to work each morning, do their best, and make a measurable difference? It’s a tough challenge, but surely the most profitable company in the world has this figured out…let’s see what we can learn from ExxonMobil’s goals! Those are some high level, long term goals, and as the largest company in the world, they should be. But coming to work every day, how many of the 82,000 employees can make a direct contribution to these? The answer is none — not when the individual’s goals are worded this way. The critical step that leaders at all levels, in companies large or small, must take is to translate high-level business goals into aligned, measurable goals within an individual’s span of control. How to do this? Just like you’d knock down a wasps nest: very carefully and with plenty of preparation. I’ll oversimplify in to these four steps; if you’re interested in a more complete set of instructions, please reach out to some of the folks in my network listed below who do this for a living. Set your overall organizational goals in specific measurable terms. For example, grow free cash flow at 20% CAGR for the next 3 years. Decompose the high-level goals into the measurable sub-goals based on how the system works. In the example above, the major levers on free cash flow are profit, net capital expenditure, and net change in working capital. At the next level of detail, the major drivers of profit are revenue and operating expenses; the major drivers of CAPEX are the number of capital projects and the size/schedule of each. Continue to expand out these measurable sub-goals until you reach tangible metrics that can be influenced by leadership teams and individual contributors (things like revenue from specific customers, OEE, and expenses by category). Measure the gaps and set targets for the detailed goals so that they add up to meet the overall goals. It’s math. This is the easy part compared to the next step. Have a series of conversations with your leadership teams and individual contributors to agree the targets, improvement projects, and timelines so that people understand the numbers, how they are mutually dependent, and take ownership of the outcome. These conversations can be truly defining moments for organizations. But don’t take my word for it – seek out the advice of some talented folks who have made goal setting and translation a focus of their careers.